Passover is called the “season of our redemption.” At its core, the purpose of the Passover seder and the recitation of the Haggadah is to fulfill this biblical commandment: You shall tell your son on that day, saying, “On account of this that the LORD did for me, taking me out of Egypt.” (Exodus 13:8). 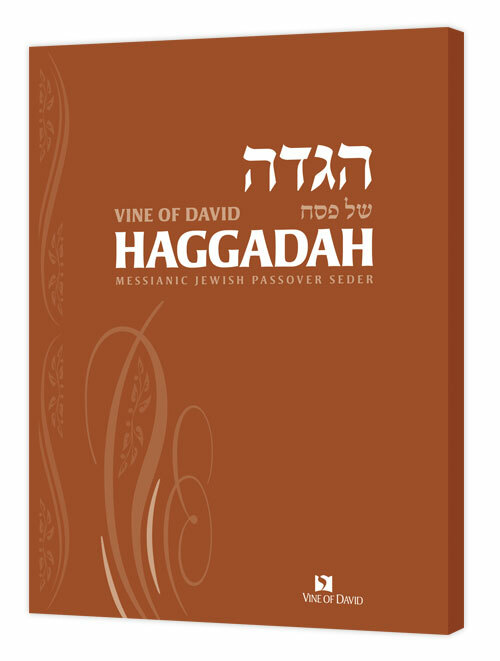 Add new depth to your Passover seder with the Vine of David Haggadah. This new translation of the traditional Haggadah, contains the complete traditional seder in both English and Hebrew, but with Messianic passages seamlessly interwoven into the text, albeit clearly marked, to create a truly authentic feeling Messianic Haggadah. This Haggadah sets a new standard for Messianic Haggadot, both in terms of production quality, content and presentation. To disciples of Yeshua, Passover takes on added depth as we remember the seder meal that he shared with his disciples the night before his death. Yeshua also began his seder by looking with hope to the ultimate redemption, as he said, “I will not eat it any more until it is fulfilled in the kingdom of God” (Luke 22:14). He also told them, “I will certainly not drink from the fruit of the vine from now until the kingdom of God comes” (Luke 22:18). Meal of Messiah, also called Se'udat Mashiach in Hebrew, the pages from this haggadah focuses on the ultimate redemption and the messianic banquet that will take place in the future. These are comments from respected Messianic leaders when the Vine of David Haggadah was first released. I have not shared it with anyone else per your request but must honestly admit an anxious excitement to show people once I order it! It is, quite honesty, the best Messianic Jewish Haggadah I have ever seen. I have plenty of Haggadot. Why should I buy another one? Actually, why should I buy another sixty copies of one? Well, at last someone has done what I have been wanting for a long time. They have produced a traditional Haggadah that integrates the words and memory of Yeshua. They have made it beautiful in terms of font and layout as well as art. They have made it readable, with very clear beginnings of sections, so that I can easily navigate and choose what to leave in and what to leave out. The Vine of David Haggadah wisely avoids the self-consciousness problem of many earlier Messianic Haggadot: it does not assume you have no idea how to celebrate Passover or that you need a theology justifying the observance of Passover. It simply exists as a tool for those who celebrate Passover and who want the full tradition and full observance of Yeshua's presence in the process. Of all the Haggadot I own, I would rate the Vine of David in the highest category for ease of use. Wow!!! This is incredible. The messianic insertions are subtle and respectful, yet profound. Overall it just feels very well through out, warm and inviting. This is a great work. I like your emphasis throughout. Just received both in the mail today. After a quick look: WOW! Excellent commentary, sharp illustrations, and I love the way Scripture was seamlessly incorporated. The accompanying 'Meal of Messiah' audio was very well sung. I can't wait to share this very meaningful and blessed resource at my Passover table! Great work! This Haggadah balances the best of both traditional Jewish, and messianic Jewish worlds, by respecting the customs and history of Israel, taking seriously the explicit commandment in the Torah to teach our children about the redemption from Egypt and the commandment of the Master to keep the festival in remembrance of him. 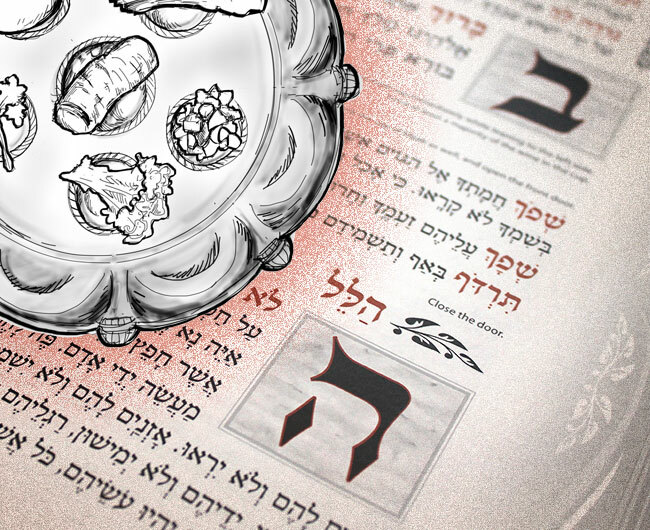 Throughout the traditional seder text, Messianic passages have been seamlessly interwoven to create a truly authentic feeling Messianic Haggadah. Lucid translation makes the plain meaning of the text readily understandable. Clean design makes the literary structure visible to the reader and easy to follow. Helpful endnotes clarify some things that might be obscure or confusing to the reader. The extensive use of Scripture is indicated. Transliteration (Hebrew text in English letters) at key points helps people who wish to recite blessings in Hebrew. English translations of songs allow them to be sung in English. Hebrew terms are explained in a glossary. Contains the complete traditional seder in both English and Hebrew. Creates an authentic atmosphere, respectful to the customs and history of Israel. Fulfills the Torah commandment to teach our children about the redemption from Egypt. Having the complete text at hand gives the leader of the seder full control to adapt the experience to the needs of the participants. Places a clear emphasis on following his directive to remember and memorialize him. Guides the participants in retelling his words and imitating his actions at that last night before his death. Incorporates passages from the Apostolic Scriptures and other ancient writings seamlessly and sensitively into the traditional text. Takes the creative and skilled design work First Fruits and Vine of David are known for to a new level. Bold and innovative artwork enhance the reader's sense of celebration and joy. Elegant, flowing, and graceful design capture and convey the holiness of Passover night. Truly professional artwork, layout, printing, and binding brings honor to God, to his appointed time, to our Master, and to Messianic Judaism.